I- During my time as a Baha’i, I saw potential converts lied to by Baha’is regarding the membership of the Faith. The Baha’is, especially the Baha’i leadership, have always grossly inflated the ‘official’ numbers in order to present an inaccurate picture to the world (as well as toindividuals considering conversion) and to make the Faith seem much more successful and influential than it really is. I do not know how to solve the above problem, except to be completely honest and open to the public and to people who may be interested in the Faith. It does little good to ‘hide’ things regarding the Faith that may be unpleasant or misunderstood, intending to reveal these things later when the new Baha’i has been in the Faith for a few years. If people feel that they’ve had the wool pulled over their eyes, they will leave or become disenchanted. Believe me, I observed this phenomenon over and over during my years as a Baha’i. These are just some friendly observations from someone who is familiar with Baha’i matters.Wishing everyone the best. II- Juan Cole (a professor of religious history and studies at the University of Michigan) commented in April 2001 that, since 1968, 50% of the people who entered the bahai faith have left it. 50% is truly a remarkably high number and reveals emphatically that something is indeed wrong about the atmosphere within the bahai faith, once one has declared one’s belief and is taken into the fold to be properly censored, coerced, and manipulated….Bahai fanatics online exude the same duplicity and dishonesty the new adherent quickly comes to realize is normative behind the facade of love and brotherhood.The Baha’i census that claim 6 to 7.2 million adherents is -A LIE- A LIE- an actual exaggeration of the real numbers. III- In India Baha’i converts in India are only required to declare: ” their belief in Baha’u’llah as an avatar”. Thing is Warren Hindus also believe that Buddha was an avatar but this doesn’t make them Buddhists. The Baha’i claim of some 3 million Baha’is in India is most obviously bogus. IV- Why the need to send people around to keep LSA membership up to nine if the Baha’i faith is actually growing?As Baha’is pass away they are not being replaced. Not even many children of Baha’is are signing up? Why, because it has become apparent to many people that the Baha’i faith is the same old,same old; that the Baha’i faith is in fact indistinguishable from past organised religions – more of a cause of disunity in the world than a cause of unity. A census refers to the procedure of systematically acquiring and recording information about the members of a given population. It includes an official count of a particular population and to add relevance, is conducted regularly.The data collected through such census is commonly used for research, business marketing, and planning as well as a base for sampling surveys. In some countries, census data is used to apportion electoral representation.Census has its uses as well as it is open to misuse. While census is largely used to establish trends (social, financial, business or otherwise), some groups use it to falsely establish that their religion / sect / group is more widely accepted than what may be the reality. A CHARACTERISTIC of the Baha’i administration is dishonesty in dealing with their census. This trickery takes place sometimes in the form of absolute exaggeration of numbers and at other times in the form of the suppression and concealment of facts; at times through the omission or perversion of essential facts or their presentation (rather misrepresentation) in such a manner so as to falsify actual data.In the writing of political history and in scheming for the triumph of a political party, we may expect crookedness in dealing with facts. However in the propagating of a new religion designed to supersede Christianity and Islam, and purporting to be an improvement on them, we do not expect to find dishonesty and misrepresentation in the number of actual adherents. Yet this is exactly what we find – “a readiness to ignore or suppress facts, and propagation of absolutely false and exaggerated data to convey to the world that Baha’i Faith is very well accepted by the masses.”Regarding their numbers, the Baha’is have indulged in gross exaggeration. Ask Baha’is about their numbers and “Millions” is the usual figure claimed by them. The Baha’i census claims that there are 6 to 7.2 million adherents of the Faith in the world which is nothing but a blatant LIE. The official Indian Baha’i site is actually misleading its visitors. They claim to be a 2.2 million strong community in India alone, which is obviously bogus and false.There are some real problems with the calculation of Baha’i population. I had my own doubts and questions about the reported numbers and wondered to what extent the teachings of the Faith had any real impact upon people in rural areas who had reportedly become Baha’is in such large numbers.One when looks at the Baha’i census of India whom Baha’i claims have largest number of Baha’is, immediately one will understand that there are three types of Baha’i census. 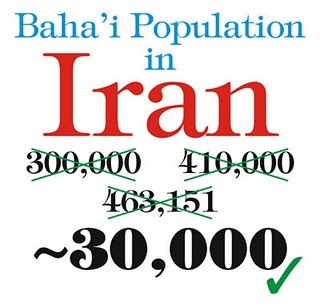 1-Bahai Census projected by Baha’i Administration through their websites. They project about 2.2 million Baha’is in India. 2-Bahai Census projected by Baha’i Administration in their newsletters and Annual Report. Here they are of the opinion that there are hundred thousand Baha’is. 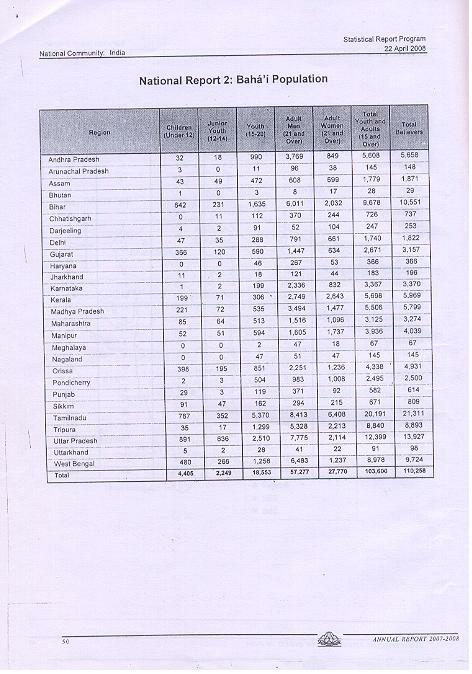 3-Bahai Census given by Government of India in their official census report. However, the official census of Government of India has something else to offer. Baha’is are quick to point out that the official census is false and full of prejudice, as most of the census officers are Hindu and they do not carry out their work honestly. They are however slow in their observation that all Baha’i census are carried out by overzealous Baha’i officers and that no person should question their integrity!It is not a hidden fact that the census conducted by the Government of India is carried out very meticulously by sincere and dedicated officers going door to door covering every household. Even if we give a 5% advantage it will not exceed 12,000. Furthermore, in questioning leading Baha’i administrators and other knowledgeable Baha’is asking them about the Baha’i population in India they have said somewhere between 13000, to 14,000. There was ready acknowledgement of the occurrence of what Juan called “fraudulent” teaching in his post. 2-Some are those who have signed the card thinking that Baha’i Faith is a social organization. 3-Some of them have signed due to deception. 4-In Pune it was reported that Persian Baha’is have gone to the villages and they have asked illiterate villagers to sign the card offering the temptation that signees would receive some scholarship. 5-In Madhya Pradesh, Baha’i speakers have gathered masses giving some lectures and the speaker asking the question. Is there any one amongst you who does not believe in God? The audience responded ‘No’. The speaker then exhorted them to sign the card. 6-One of the Bahai official who visited India in 1984 claimed in his speech at the Baha’i Centre that he would have easily collected 200 addresses of people saying they are Baha’is although they gathered there under the name of a Medical Camp. 7-Many false addresses were given to acquire number of delegates especially in Madhya Pradesh and Uttar Pradesh. Why should the Baha’i authorities wish to project an image more than its reality? 1-It is in order to present an inaccurate picture to the world (as well as to individuals considering conversion) and to make the Faith seem much more successful and influential than it really is. 2-These addresses are recorded as “Bahais” to show to the Government of India as the number of Baha’is to gain minority status by deception and to avail all the facilities and privileges given by Government of India to its minorities. It was fairly apparent that declaring oneself a Baha’i did not mean that an individual was being put in the position of having to “leave” his own religious tradition (which in this case was primarily Hindu). The declared Baha’i for the most part continued to practice traditional behavioral idioms. Moreover there was little indication that they had abandoned the Hindu “world view”.It originated from Iran the most of the high ranking officers are Persian with head quarter in Israel.They have incorporations of Assemblies, cluster growth reflection meetings, administrative sanctions, deprivation of voting rights, elected arms appointed arms, elections at local state and national assemblies, counselors, auxiliary board members etc to fit requirements of an NGO and not a divine religion. Surely these are far from the conditions satisfying the requirements of major religions of the world.My own conclusion was that the Baha’i Faith better fits the category of an NGO and not one of the eight major religions of the world as is claimed by the Baha’is.My Iranian friends should not be made to believe that the world is full of fools. Rather they are living in a fool’s paradise. By simple repetition a lie cannot and will not become the truth. The Baha’i population in India is not more than 13,000 and in the world by any means they are not more than one hundred thousand. For a religion to progress and propagate, sincere service is required to attract the masses and not lip service to attract the masses and then believing that they have abandoned the religion of their ancestors. They cannot increase their numbers by Ruhi books or by simply parroting Ana’s presentation. 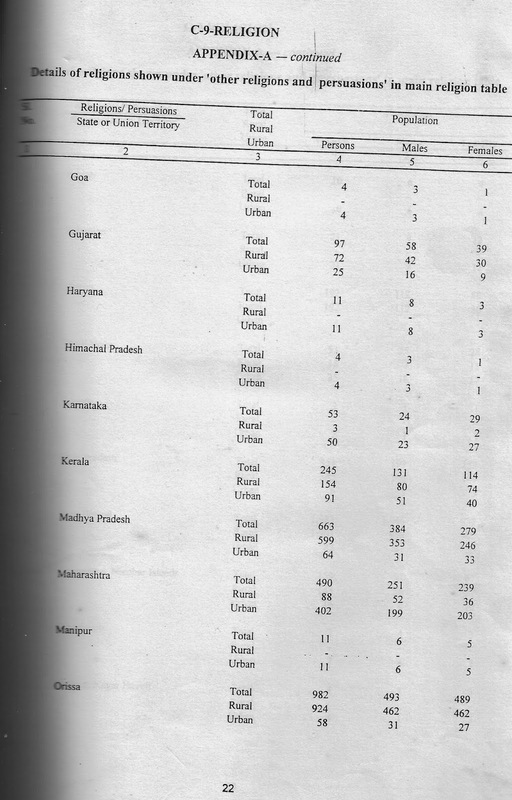 (3) Indian Census Returns, 1991, for the Baha’is of India. From: Dr. M. Vijayanunni, ed. 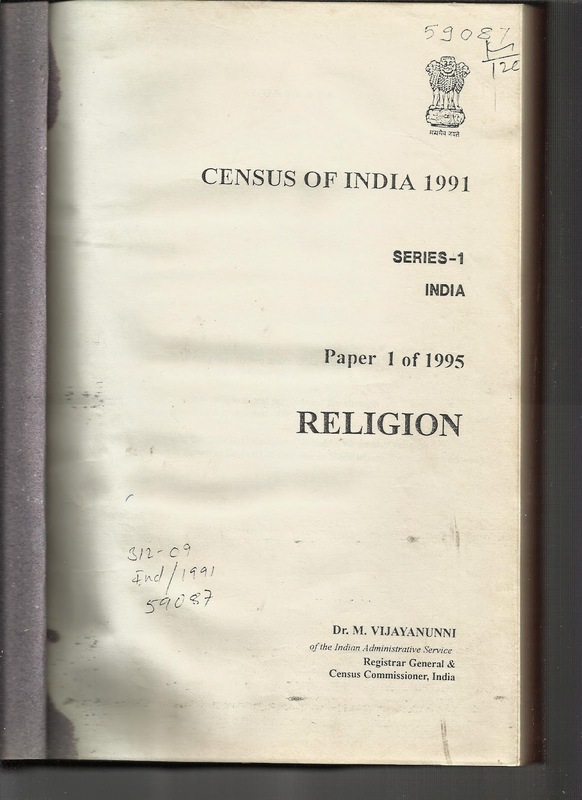 Census of India 1991, Series-1, India, Paper 1 of 1995: Religion. 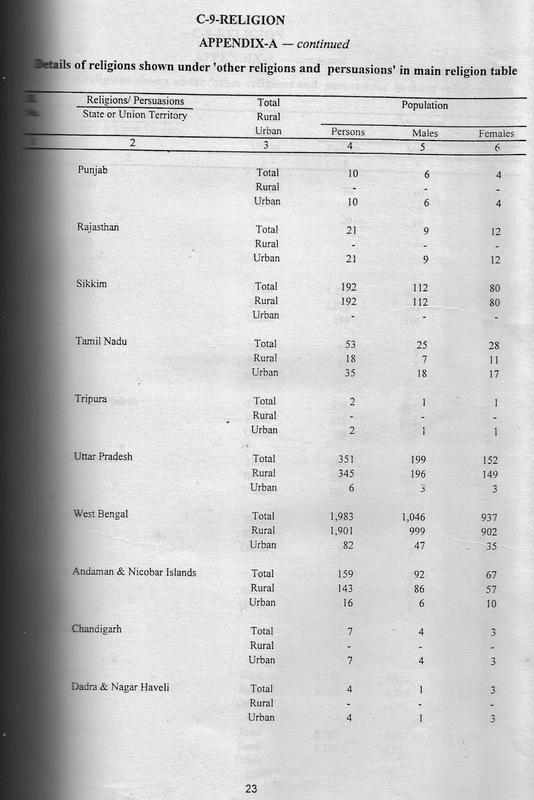 (New Delhi: Census Commission, 1995). Your article about Baha’i census is well written and well researched. It is absolutely true that Baha’i s exaggerate their numbers many fold so as to project that they are accepted by the masses. I feel that the situation is not just in India but must be in every country. There are a few more reason so as to how the Baha’i s calculate their exaggerated number. A-Once a Baha’i is registered in their record (By whatever means) he becomes immortal and he never dies. So the Indian Baha’i census has all those Bahais who registered themselves since the time of Abdul Baha and Shoghi effendi. B-It is a universal phenomenon, every where that Bahais usually signed the card not knowing that it is an independent religion. After his realization he leaves the Faith and he is no more a Bahai. But the Baha’i administration believes that “Once a Baha’i Always a Baha’i”. The process is irreversible. C-Bahais usually multiply their number many folds thinking that every Baha’i must be married and therefore must be having a wife and few children. 1-removing the name of Bahais once they die. 2-removing the Cards of the Bahais once they leave the Faith. 3-checking all the addresses collected by the National Office, whether those people exist or not. It is only then that the number 11,000 is the most appropriate figure as given by Official census of Government of India. At the end I would like to quote your sentence, “For a religion to progress and propagate, sincere service is required to attract the masses and not lip service to attract the masses and then believing that they have abandoned the religion of their ancestors”. Comment by S.Khare Bhopal M.P. The Baha’i administration claims there is no resident Baha’i population in Israel. The 650-700 Baha’is who can be found here at any given time are all volunteers who have come from some 85 countries to do service for periods ranging from a few months to a few years. The Baha’is who live here as tourists or temporary residents do not engage in any form of missionary activity. Some people erroneously believe that this is in accordance with the country’s anti-missionary laws, but in fact it is a self-imposed Baha’i prohibition against seeking or accepting new believers into the Baha’i faith in the Holy Land that dates back to the time when the country was still under Ottoman rule. No one knows why. It is one of several inexplicable Baha’i regulations (Read more about this regulation). It is a well known fact that according to a letter of Universal House of Justice1 the Baha’i s are not suppose to teach and convert the Jew population in Israel. Infact if a Jew outside Israel wants to accept Baha’i Faith and settle in Israel, then his declaration card is not to be accepted. Russian Bahai Census: How Many Actually? For Baha’is decimal places don’t count! Baha’i Faith transacts only in hundreds. Small currencies don’t exist. And now, this has been seen in Russia! No one would believe that behind the solid iron curtain and fool proof government watch, such manipulations can prosper! Strange but true, the Baha’i Faith official census can fool all systems. Going by the words (and not spirit) of deceased guardian of Baha’i Faith – Shoghi Effendi – “Bahá’u’lláh has entrusted the sacred duty of every Baha’i to spread the Faith”, the Baha’is have found an easier way to spread the faith. SPREAD THE NUMBER! 1. There have been rigorous conversion activities over the past fifty years by the Baha’i Faith. 2. These conversions were accelerated with the construction of the Lotus Temple at Delhi and with the visits of Hands of the Cause Dr. Rahmatulláh Muhájir, and Amatu’l- Bahá Ruhiyyih Khánum. 3. 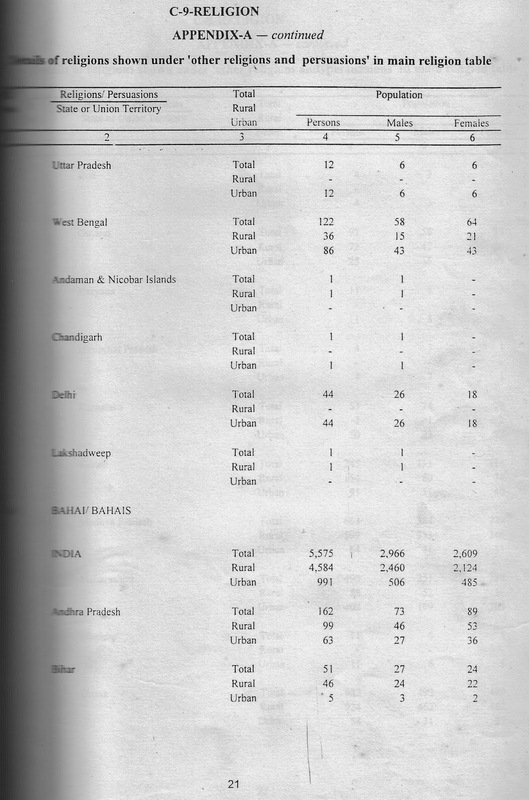 Though the Baha’i records of the data on Baha’i population shows that one time it had crossed two millions yet the Census of India reports of 1971, 1981, 1991 and 2001 show only a fraction of the total number Baha’is throughout the country. 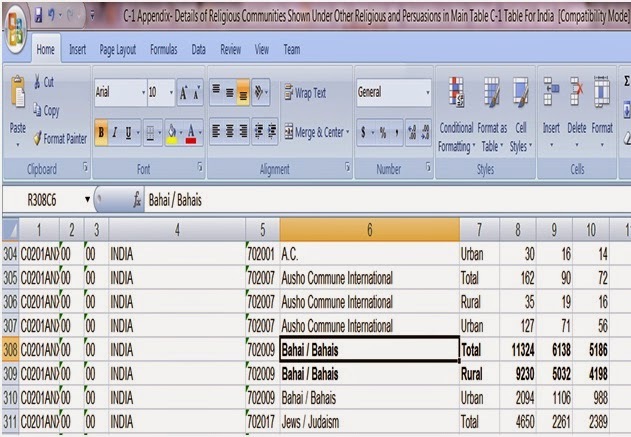 This means that the census department of India fumbled four times to give accurate number of Baha’is. Just to cite an example, Baha’i census figures in 1991 was 5575 and in 2001 it was 11,324 against 2.2 millions claimed by the Baha’i administration. World Bahai Census: How Many Bahais? The first article is a very moderate view of the author, whereas the second article “The Three Type of Baha’i census of India” is much deeper analysiation supported by documents authenticated by figures.